August 2010 – The 2011 US Open Championship may be over with Rory McIlroy taking home the gold but there is a solution for all your golf fans. 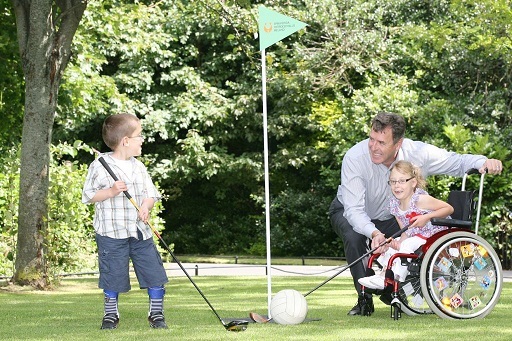 The former Irish goalkeeper Packie Bonner recently launched the annual Packie Bonner SBHI (Spina Bifida Hydrocephalous Ireland) Golf Classic which will take place at Glasson Country House Hotel and Golf Club, Athlone Co. Westmeath on Wednesday, 20th of July. The Irish sporting legend is calling on golfers from Abbeyleix Golf Club, Heath Golf Club, Mountrath Golf Club, Portarlington Golf Club, Rathdowney Golf Club and The Heritage Golf and Spa Resort to support Spina Bifida Hydrocephalus Ireland at this fantastic sporting event. There are a number of competitions on offer for participants, such as beat the pro, nearest the pin, longest drive, par three competitions as well as the chance to win a car worth over €30,000 up for grabs for the first hole in one at hole 15! Country House Hotel and Golf Club is a 4 star lakeside golf hotel located close to Athlone in County Westmeath in the Midlands Ireland and is renowned for its warm welcome with outstanding panoramic lakeside views. Nestled on the tranquil shores of Lough Ree, this family-run Country House Hotel is the ideal get-away and is easily accessible for participants residing anywhere in Ireland. “We are delighted to have Packie Bonner supporting this crucial fundraiser for our organisation. Packie is a patron of the association and has helped us in many ways including raising awareness and participating in many events over the past number of years,” said George Kennedy, Chief Executive of SBHI.